Elveflow>Microfluidics tutorials>Microfluidic reviews and tutorials>Fittings & Tubing Resources>Accessories Definitions>What is a Wrench Tight Fitting ? A wrench tight fitting has a head geometry that can be properly tightened with a wrench. It is important to specify the diameter from flat to flat side of the head to use the correct wrench. 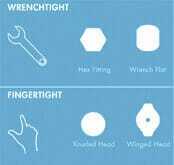 The 2 mostly used wrench tightening geometries are the Hex-head and the wrench flat.